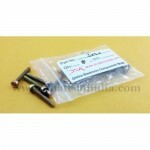 Purchase online 3mm X 10mm Spacer in India at low price from DNA Technology, Nashik. Want to mount your PCB on a acrylic sheet or a plywood or a metal sheet? Then you will be requiring some spacing between the mounting surface and your PCB. That's where these low cost plastic spacers comes into use. This is 3 mm X 10 mm Industrial grade plastic Spacer. This pack contains 16 spacers.